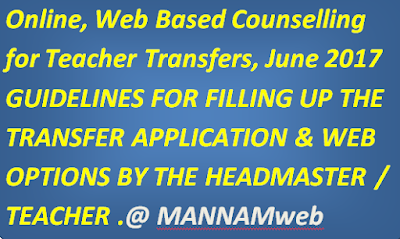 Online, Web Based Counselling for Teacher Transfers, June 2017 GUIDELINES FOR FILLING UP THE TRANSFER APPLICATION & WEB OPTIONS BY THE HEADMASTER / TEACHER . Welcome to all the Headmasters and Teachers to the online, web based transfer counselling system. This is designed to facilitate an easy, transparent, objective way of identifying vacancies, filing transfer application and making options/choices one is interested in. The Centre for Good Governance (CGG) is providing al technical support to facilitate the online application submission and web options exercising and drawing up of seniority lists and transfer lists. 7. Auto-Populated Fields: i) When the application form is opened, you will find that the some of the fields are auto populated. This is done to make the process of submitting your application easy and quick. The fields that are auto- populated or filled up in advance with the required information are: a. Name of the District b. Zone, Mandal c. Treasury Id, Date of Birth d. Gender e. Present working School Code with name and management 2 f. In case of HM/Teacher is a Recognised Teachers’ Union Office bearer, the system will generate the points as per the orders of Government ii) If the datais not correct or does not relate to the candidate, press 'BACK' button. 9. If HM/Teacher wants to avail Spouse points then give details like Treasury Id, Name, Designation, Working office, District, Mandal, of the spouse. 10.If the HM/Teacher is working as NCC / Bharat Scouts and Guides officer a. Select appropriately and indicate from which date he/she is working as NCC/ Bharat Scouts and Guides Officer in the present school b. If he/she is working as NCC officer, then select working wing i.e. Navy/Airforce/Army from drop down menu. 11. Performance Points that will get automatically displayed a. If HM/Teacher is registered with APeKX b. School Performance points, i.e. increase in enrolment, transition, CCE, School % performance in SSC exams, and MDM marks. c. Individual performance points i.e., CCE, performance in SSC exams. 12. Preview, Submit, Reference number a. After filling all the details, press PREVIEW button,it will display the details submitted by them. b. Ifall the details arefound to be correct, press SUBMIT c. If some of the details are not found to be correct, press EDIT and resubmit the information. d. Verify the correctness of the entitlement points obtained before the submission of their applications. e. On submission of application form online the candidate shall be given reference ID number which should be kept carefully for any kind of future correspondence. Submission of application can be considered to have been completed only on receiving reference ID number. f. On completion of submission, the candidates shall take a printout of the application, along with the certificates and store it for future use. 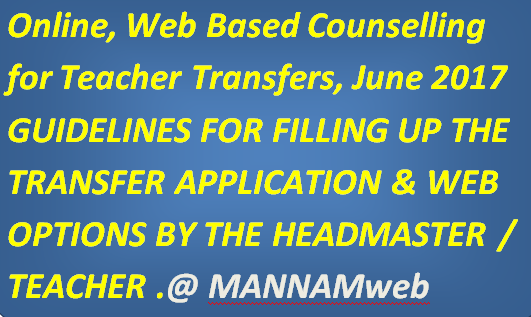 Download........pdf file of.. Online, Web Based Counselling for Teacher Transfers, June 2017 GUIDELINES FOR FILLING UP THE TRANSFER APPLICATION & WEB OPTIONS BY THE HEADMASTER / TEACHER ..